Speed up to match the speed of the car behind you. Move into the lane to your right and let the other car pass. Slow down to antagonize the driver. If you are being followed too closely while driving in the left lane of a multilane roadway, merge to your right to allow the other car to pass. The far left lane on a multilane road is intended for use by faster-moving vehicles passing slower traffic. Wait until the light turns green to proceed. Continue through the intersection without stopping. A flashing red traffic light should be treated in the same way as a stop sign. An approaching driver must come to a complete stop and proceed only when it is safe. Into the first available lane. Into the last available lane. 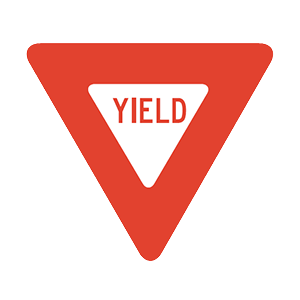 When there are no signs or lane markings to control turning, a driver should turn into the first legal lane in their direction of travel. Collisions are less likely when drivers do not change lanes while turning onto a new street. Highway work zones are established according to the type of work underway along the roadway. Signs in work areas are typically diamond-shaped, orange, and displaying black letters or symbols. They serve as a warning that people are working on or near the highway. Cars on the right move first. Let cross traffic pass before proceeding. When approaching this sign, you must yield the right-of-way. Slow down and let vehicles and pedestrians crossing your path pass before you proceed. If necessary, stop before going ahead.